I’m about to sample my first forkful of Chef Rosario Rubio’s Chicken Waldorf Salad — Hispaniola style. Yesterday, I had the good fortune of meeting the chef to ask what he would serve a couple on a romantic getaway at the Marina Sands Luxury Resort near Punta Cana, Dominican Republic. With the aid of Elven and Regino, through frowns, gesticulations, and lots of smiles, we breached the language barrier. I got the message, and then some. “Come over to the Bistrot tomorrow and I’ll have a meal prepared for you.” Now it was my turn to smile. Regino has set a place for me in the elegant dining room. He raises one of the large sun screens, unveiling a fantastic view of the sun-drenched Caribbean Sea beyond the pastel Mediterranean-style resort. A gentle breeze caresses my skin. Presented on crisp romaine lettuce, the apple is cubed into dainty bits. Morsels of delicately thin chicken strips subtly fleck the creamy salad, which is topped with small pieces of pineapple and garnished with sliced red grapes. The overall effect is a delicious, tropical coolness on the tongue. A soup course follows, artistically decorated with a creamy swirl. As the bowl is placed before me I get a distinct ocean aroma. Pointing to the soup I tell the chef, “I smell the sea.” Regino translates — it’s lobster bisque. It has the smoothest texture of any lobster bisque I’ve tasted. The young chef hails from Santo Domingo, capital of this Spanish-speaking country. He spent two years as chef’s assistant, then followed a five-year apprenticeship. Now he proudly wears his chef’s hat here at the Bistrot. The fish course tastes as good as it looks, succulent grilled grouper drizzled with a blend of olive oil, butter, lemon juice, and garlic and stacked on a bed of sautéed potato cubes, zucchini disks, and baby Roma tomatoes. Now for the main dish: home-grown chicken cubed and sautéed, then completed in a delicate curry sauce. This is presented vol-au-vent style and garnished with tropical fruit and fresh herbs. As a pleasant complement to the meal the choice of wine is Santa Carolina, a Chilean Chardonnay. Rubio and the duo wait expectantly for my reaction. I might only have been at the Marina Sands for a couple of days, but I know just enough to say muy rico — absolutely wonderful. The best is saved for last which happens to be my favorite — Tiramisu. 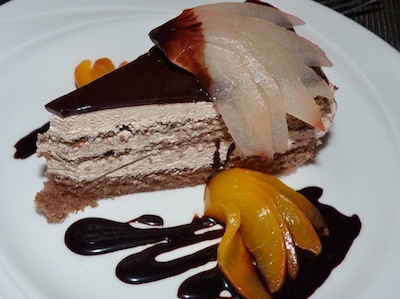 Adorned with sliced poached pear and mango, it does not disappoint. The feather-light sponge cake is soaked in the perfect amount of espresso. Layered with a creamy mascarpone blend and topped with ganache, every bite is a melt-in-your-mouth moment. If you like a dark roasted cup of coffee with boldness plus a hint of acidity, then this locally-grown bean is for you. Just when I thought I was done, out comes a shot of Baileys — the cherry on top.